Tim Bradbury/Getty ImagesAfter returning from a year-long hiatus, Simone Biles reminded the world why she is the best gymnast in the game. Less than 12 months after taking a year off from training, Simone Biles earned a perfect 16.000 on a vault routine that has never been attempted in women’s competition history en route to clinching her spot on the world championships team. The 21-year-old tallied 59.7 points – more than two points ahead of the next-best competitor – to win the all-around at USA Gymnastics’ selection camp Thursday. Biles will head to the 2018 World Artistic Gymnastics Championships in Doha with a chance to become the winningest gymnast in world championships history. Less than 12 months after taking a year off from training, 2016 Olympic individual all-around, vault, and floor gold medalist Simone Biles reminded the world why she is the best in the business. The 21-year-old tallied 59.7 points – more than two points ahead of the next-best competitor – to win the all-around at USA Gymnastics’ selection camp Thursday and clinch her spot on the world championships team. Although Biles excelled in all four events, she executed a flawless vault routine that no woman had ever attempted in competition history to earn a perfect 16.000 score. Biles took more than a year off after securing four gold medals in Rio and won both of her comeback meets this summer. At nationals this August, she became the first gymnast since 1994 to sweep all five gold medals and the first woman older than 19 years old to win the U.S. all-around title since 1971. 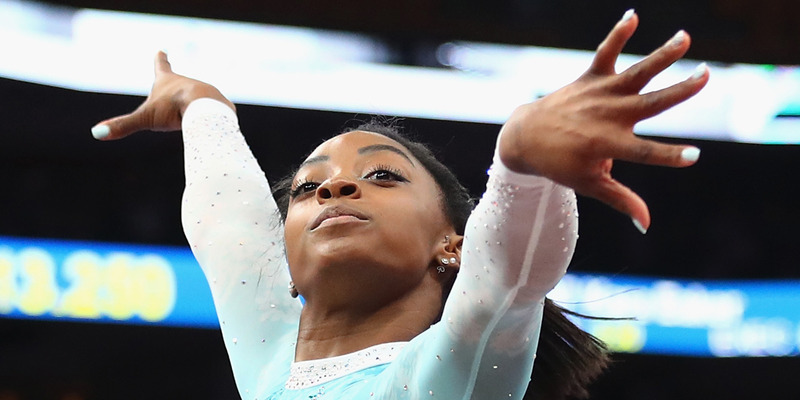 Biles has been undefeated in official all-around competitions for more than five years. The three-time world all-around champion, three-time world floor champion, and two-time world balance beam champion will team up with reigning all-around world champion Morgan Hurd along with gymnasts Kara Eaker, Grace McCallum, Riley McCusker, and Ragan Smith to form the 2018 World Championships squad. Beginning October 25, the six-gymnast team will compete at the 2018 World Artistic Gymnastics Championships in Doha looking to claim their third team gold medal in the last four years. Biles already owns the women’s record for most gold medals earned at worlds with 10, but she has the chance to break multiple World Artistic Gymnastics Championships records in Qatar. Biles would need to earn two more gold medals to break Svetlana Khorkina’s record for most gold medals in women’s individual events and four more gold medals to break Vitaly Scherbo’s record for most individual gold medals overall. She will also look to chip away at the overall medals records in worlds competition. Khorkina owns the women’s record with 20 medals in six World Artistic Gymnastics Championships appearances, while Scherbo holds the record overall with 23 medals in six competitions. Biles will travel to Doha having earned 14 medals with just three world championships under her belt.